More than 25 small earthquakes were recorded off the Bay of Plenty coast overnight, continuing a swarm of quakes that began on the evening of May 15th. Of the 26 earthquakes analysed up until ten o’clock this morning, two were magnitude 4, six were magnitude 3 and 18 were magnitude 2. All were located ten to twenty kilometres north of Whakatane (about 20 km north-east of Matata) at depths of up to six kilometres. Activity began at 2:38 this morning when a magnitude 4.3 earthquake struck 20 km north of Whakatane (20 km north-east of Matata) at a depth of 5 km. This quake was felt from Edgecumbe to Opotiki, strongly at Whakatane. A smaller magnitude 2 quake followed and then a magnitude 3.2 quake struck ten minutes later. This quake was felt from Edgecumbe to Waiotahi and inland at Waimana. Four magnitude 2 events followed before a magnitude 4.0 quake struck at 3:42 a.m. This event was was closer to Whakatane, being centred 10 km north of the town at a depth of 5 km. Shaking was felt from Edgecumbe to Opotiki, and inland at Taneatua. Three more magnitude 2 quakes occurred before a magnitude 3.7 quake, which was felt inland as far as Waimana, struck at 4:21 a.m.
Six more magnitude 2 events were recorded until another magnitude 3.7 quake struck at 5:03 a.m. This quake was very shallow (described as 0 km deep) and centred 10 km north-west of Whakatane (10 km north-east of Edgecumbe) and was felt over a larger area. Felt reports have been filed from Matua (near Tauranga) to Waimana and from Rotorua. Activity continued with three more magnitude 2 events before a magnitude 3.5 quake, which was felt from Matua to Opotiki, struck at 6:19 a.m.
A magnitude 3.1 quake was recorded at 7:32 a.m. and a magnitude 3.3 event at 9:54 a.m. at which time activity ceased for a few hours. Another two earthquakes of third magnitude struck the area just after midday today. The earthquakes are occurring on faultlines caused by the stretching of the Waimana Plains as tectonic forces cause East Cape to move further away from the Coromandel Peninsula. This spreading action occurs at a rate of about a centimetre per year, through earthquakes such as this swarm. This map, courtesy of GeoNet, shows a snapshot of the last two months’ earthquakes in the area up until 10 o’clock this morning. It is a snapshot and will not be updated as further quakes occur. The updating map, showing two months’ worth of quakes as they are analysed can be found here. On the 15th of May a lighter swarm of quakes struck the same area. GeoNet advises that swarms of earthquakes are not uncommon in the Bay of Plenty, with some continuing for days, weeks or months. The nearby coastal town of Matata has been plagued by swarms of shallow earthquakes in recent years, most notably in 2005 when three distinct swarms rattled residents between February and August adding to the misery caused by a flash flood. Matata experienced another swarm which ran from December 2006 until June 2007. Another burst of activity was recorded in September and then from December 2007 until February 2008 after which activity dropped to about 5 events per month before ceasing during August 2008. Earthquake swarm activity has occurred at two other locations in the Bay of Plenty this month. A small series of magnitude 3 quakes was recorded near Kawerau at the beginning of May and a swarm of five earthquakes centred about 100 km north of White Island has included a magnitude 5.0 event. 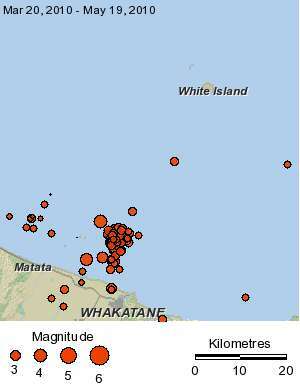 The most recent events near White Island included two magnitude 4 quakes which struck six minutes apart on May 17th. This entry was posted on Thursday, May 20th, 2010 at 2:23 pm and is filed under Earthquakes - Analysis. You can follow any responses to this entry through the RSS 2.0 feed. You can skip to the end and leave a response. Pinging is currently not allowed.